If you really thought about all the ways the beach can ruin your vacation (or potentially end your life), you'd probably reconsider a trip to the shore. And, in fact, 2015 proved to be the worst year on record for one of the worst reasons: shark attacks. Unprovoked shark attacks reached an all-time high in 2015, according to the International Shark Attack File, with a record 98 attacks, 10 more than the previous record of 88 attacks in 2000. 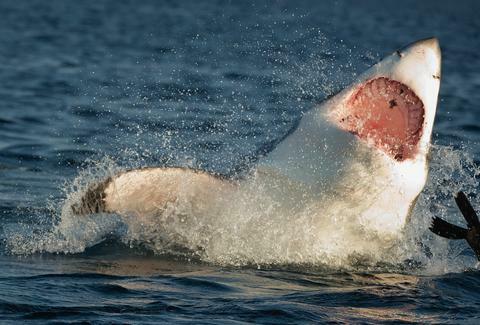 The ISAF recognizes "unprovoked shark attacks" as "incidents where an attack on a live human occurs in the shark’s natural habitat with no human provocation of the shark." So, the 98 number refers only to attacks that fit that exact definition. However, the report makes it clear that this doesn't mean that sharks were extra pissy this year. The increase in attacks could just be due to an increase in the human population, and it's also important to note the rate of fatal attacks was no higher than normal. In addition, social media could be playing a part in the results. The report acknowledges that some attacks may have been missed in previous decades, and that social media has encouraged documentation of events. After all, if you're attacked by a shark, that's definitely showing up in your Facebook Year in Review. All these factors aside, 98 is still a lot of shark attacks. And, as is the norm, most occurred in North America, which accounted for 75 of the attacks, or 76.5% of worldwide attacks. But to once again reel in some of that fear, there was only one fatal shark attack in the US this year. Not that it's a consolation to anyone who's being bitten by a shark. Who's getting attacked? Surfers made up 49% of worldwide shark attacks, given that they kind of look like seals and are splashing around in waters commonly inhabited by sharks. And lastly, if you're attacked by a shark, the report says the old "hitting a shark in the nose trick" is still the way to go. Preferably, you would hit the shark with an inanimate object. But, hell, punching out a shark and living to tell about it is a pretty cool story. That last statement is not approved by the ISAF. Kara King is a News Writer at Thrillist and will be avoiding the water. Send news tips to news@thrillist.com and follow her at @karatillie.